It's "International Fake Journal Month"! What that means is that hundreds of sketch artists around the globe will be taking on a new persona, who will compose their April sketchbook journal. 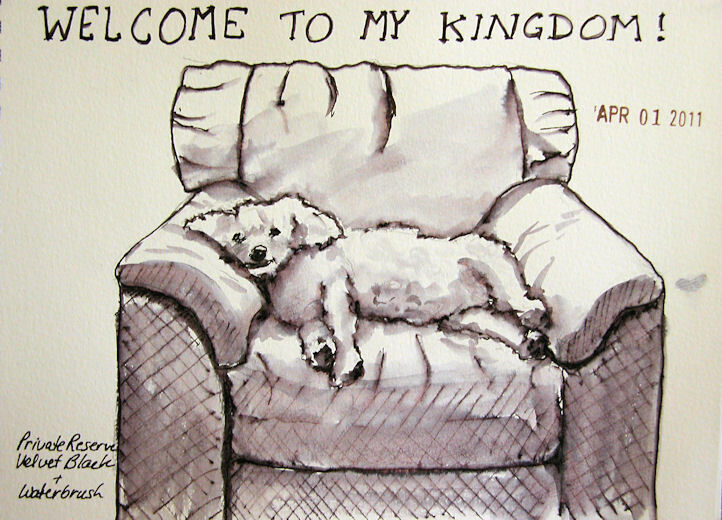 I have chosen my Bichon Frise, Rondo, to introduce you to his kingdom. My journal is titled The World According to Rondo. 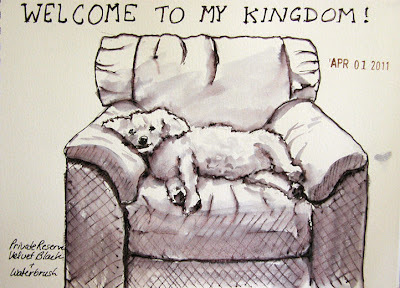 Here he is on one of his thrones, doing what he does best: supervising. Along with Rondo's adventures, I'll be discussing inks this month. Each post will feature a new ink I've been working with, so if you're interested in inks that work well for sketching purposes, stay tuned! This sketch was done with Private Reserve Velvet Black. I love the rich darkness of this ink, which makes the values spring to life. It washes into a subtle violet with a waterbrush, which I find so much more appealing than the blacks that just wash to gray. It also holds a line really well, so even though I can use it for ink and wash techniques, the lines of my sketch stay put. The sketchbook I'll be using as my fake journal is a Maruman Art Spiral. It's very heavily sized and works well for wash techniques, and at 24 pages long, it's ideal for this project. Those who know me are aware of my intense dislike for spiral journals, so I hope I survive the month with this one. The spiral is very small, so hopefully it will be less pesky than most, and I'll be able to do some two-page spreads. If you'd like to keep following as I showcase more inks and Rondo's little world, just add your email address in the Subscribe box on the right sidebar. 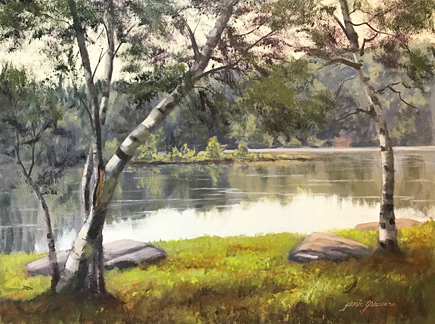 I don't plan to post every day, since I have some painting commissions to do and shows I need to paint for, and of course plein air season is getting underway! But I do hope to get in at least 10 sketches in this project, and maybe more. Rondo certainly has the best seat in town!